Wine. So simple, yet so complicated, but it’s an undeniable truth that if you want to learn to eat and drink like a WASP, you need to know wine. Few drinks speak to WASP culture as well as a First Growth Bordeaux, a Grand Cru Burgundy, or a bottle of vintage Champagne. Unfortunately, while most people are fully capable of drinking wine, surprisingly few know how to properly taste and appreciate it. Wine. Learn it. Love it. “Why should I bother with all that fancy tasting stuff when I can simply drink what’s in front of me and enjoy it”, you may be asking? Well, there are a couple reasons. First, it’s only a matter of time before you’re at a dinner somewhere and someone offers you the tasting on a fresh bottle of wine. At that point you will have two options 1) Embarrass yourself by admitting that you don’t know what to do, or 2) Really embarrass yourself by accepting the offer and then screwing it up. Secondly, nothing will offend your average WASP oenophile more than watching someone throw down a glass of their 1982 Chateau Lafite Rothschild like a shot of cheap tequila. And finally you might actually find you enjoy your wine more by taking the time to evaluate it. Excellent, so we both agree that tasting wine is something you need to learn how to do. Fortunately it really isn’t that difficult. Lets start with the dinner example from above. 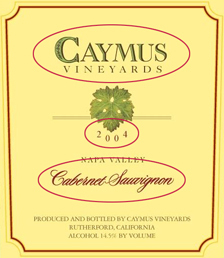 When inspecting a bottle, verify the producer (Caymus), the vintage (2004), and the variety (Cabernet Sauvignon). 1) The waiter (or Sommelier) will bring the bottle and present it for inspection. Basically your job is to verify that it’s the same thing that was ordered. Give it a brief once over paying particular attention to the producer and the vintage (year). If something is wrong, make sure to say something (Unless of course you know enough to spot when the mistake has been make in your favor…) If everything checks out, you may proceed. 2) At this point you may also want to feel the bottle of wine for temperature. Generally you’ll want your red wines served between 60-65 degrees, whites between 55-60, and sparkling wines between 45-50. As an easy frame of reference, keep in mind that your fridge keeps liquid at around 50 degrees. If a bottle is too warm, it’s acceptable to ask for a bucket of ice to chill the wine before it’s served to the table. 3) The bottle is opened table side and you’ll be given the cork for inspection. Pick it up and make sure it feels like normal cork, not dried out or excessively moist. Visually inspect it for things that don’t look right. Mildew (a little on the top is OK) or other odd discoloration are bad signs. You may smell it as well if you like, but that’s not really necessary. 4) Once the bottle and cork have passed muster, it’s time to get down to business. The waiter will pour a small amount of wine into your glass and then it’s showtime. 5) Pick up the glass and inspect the color of the wine, preferably against a light background, like a tablecloth. At this point you may think that wine simply comes in red or white, but try to get beyond that and look more closely. If it’s red is a really deep, almost purpley, red or is it a lighter ruby, or even brownish? If it’s a white is it pale or a deep golden color, is it slightly greenish? Don’t spend a long time here, maybe just a few seconds, but make sure you do it! 6) Next up is the swirl. 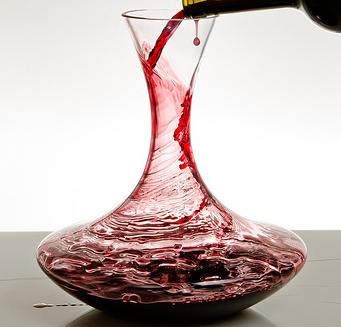 Take you glass and rotate it in small circles to get the wine up and swirling around the side of the glass. Make sure to keep it under control because if the wine leaves the mouth of the glass, it’s game over. 5-10 good rotations are ideal for most wines. Sparkling wines only need 1 or 2. Get your nose right in there and concentrate. Don't cut corners here, it's the most important step! 7) Stop swirling and quickly stick your nose into the glass. Again, use common sense here and keep your nose out of the wine… Inhale slowly through your nose and think about what you’re smelling. 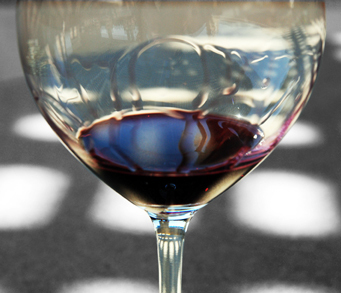 Is it light and barely perceptible or is the aroma (“nose” in wine-speak) strong and intense? Pull your nose back, take in a fresh breath, and repeat at least one or two more times. Make sure to take your time as this is the most important step in tasting wine! 8) In a restaurant it’s acceptable to to simply give the wine a pass/fail rating. However in a more formal tasting situation, you make be required to describe what you smell. No fear, just check the tasking cheat sheet below for some helpful hints. If the wine is a “fail”, you’ll know it immediately. It will smell like mildew, sulfur, or something else you don’t want to put in your mouth. If that’s the case, stop here and send it back immediately. 9) Assuming the wine passes the smell test, it’s finally time to taste. Ideally tasting is done in three steps: First take a small sip and immediately swallow to acclimate your mouth to the wine. Next take a full sip and hold the wine in your mouth. If you can, draw in a little air through your lips to help release aromas. Move the wine around in your mouth letting it coat your tongue, cheeks, teeth, etc… and swallow. Take one more sip and repeat. What you’re looking for is sweetness (or lack thereof) in the wine, acidity (how tart the wine is), tannins (that dry, cotton-mouth feel, similar to when you drink tea), and the level of alcohol. Ideally these tastes (the wine’s “pallet” ) will all be in balance without any one dominating over the others. 10.1) If any aspect of the wine seems “iffy” there’s no shame in asking someone else at the table for their opinion. People will always interpret the aroma and taste of wine differently and sometimes a second opinion is warranted. If the wine is bad, then make sure you send it back. While it can be awkward to refuse a bottle of wine, it’s not nearly awkward as giving your approval and then being responsible for everyone at the table getting stuck with bad wine. That’s all these is to it! That procedure will serve you well no matter what WASP’y wine situation you may find yourself in, be it a fancy restaurant, a dinner party, or attending a wine tasting. Ah yes, wine tasting. What is that about? Why it’s a perennial WASP favorite where people gather and do nothing but drink and discuss wine. Sounds like fun, yes, but remember that this is a situation where you’ll required to go beyond the simple pass/fail test and actually describe what you’re tasting. How to go about doing that? Well that’s where things can get more difficult. Fortunately we’re here to help! When it comes to wine, most of the “flavors” you detect are actually scents and identifying those scents are the bread and butter (both actual wine descriptors) of any wine tasting. 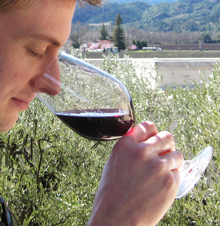 If you’ve ever attended a wine tasting, or even read the description on the back of a bottle, you might be a little put off by the depth of aroma/flavor analysis. After all, how the heck can a grape product smell like pencil shavings, root beer, or tar? Well, we’ll get to that, but first we need to recognize that the vast majority of the scents in a glass of wine come from two sources: The fruit from which the wine was made and the wooden barrel it was fermented and/or aged in. The Fruit: The aromas generated here typically smell like… wait for it… fruit! What kind of fruit depends largely on the grape variety used. Instead of trying to pick out individual flavors, try to classify the smell in broader group. Below are some of the most common. The first two apply mainly to reds, the latter three to whites. 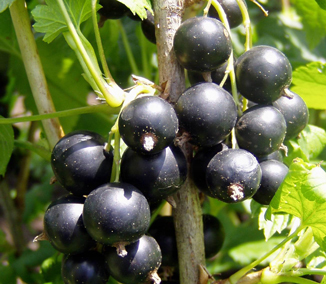 Black Currant (AKA Cassis) is a little known berry in the US but is a common descriptor for dark red wines, such as Cabernet Sauvignon. Once you’ve identified the group, then you can start to name individual flavors. The good news here is that no one can challenge your assessment of specific flavors since everyone experiences wine differently, so be bold! As long as you can identify the broad group, you’ve got the freedom to say whatever you want. Note that it’s possible for the grapes to produce other scents as well. Examples include a grassy aroma, vegetables, flowers, or earthy flavors such as mushrooms or truffles. 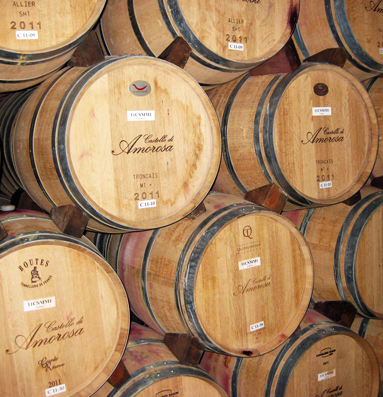 Wine aging in French Oak barrels. 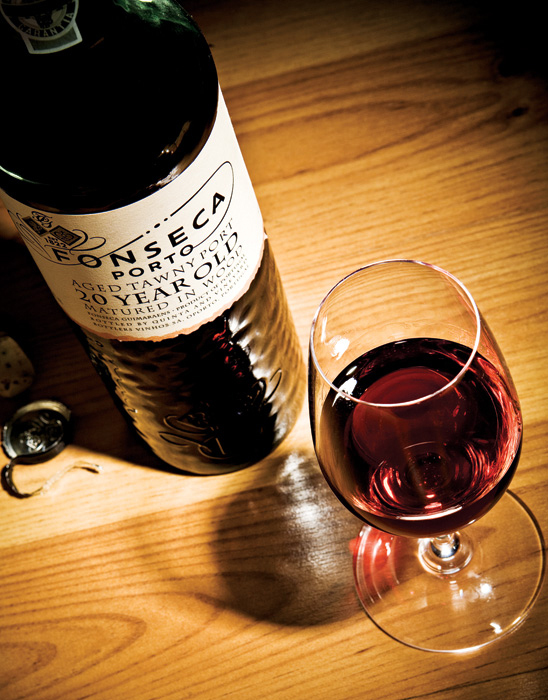 The wood contributes tannin and a range of new flavors and aromas to the wine. Note that if a wine wasn’t aged in wood, as in the case with most whites, non of these flavors will likely be present and you can simply focus on the fruit as described earlier. 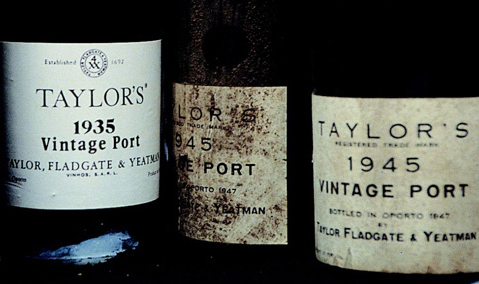 How do you know whether a wine was aged in wood or not? Simple, just ask! Quite the opposite of sounding ignorant, any good wine-geek will appreciate your interest in the vinification (winemaking) techniques behind the glass you’re about to sample. If you can identify the fruit and wood flavors in a glass of wine, you’ve got all the tools you need to conquer any tasting situation. But wait, now it’s time for the fun part! Remember all those crazy descriptors on the back of the label? Well once you’ve proved that you can identify the basic aromas in a glass of wine, you then have license to go crazy and add in your own unique ideas to the mix. Does it smell like playground mulch? Maybe Domino’s pizza crust? Sky’s the limit and again, who’s to say any different? Sweetness: Perceived up front by the tip of your tongue, sweetness levels in wine speak range from “dry” (not sweet) to “off dry” (kinda sweet) to just regular old “sweet”. Acidity: Basically a fancy word for the tart or sour flavor in a wine. 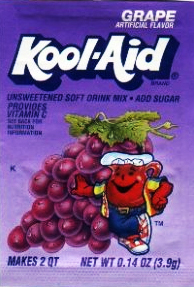 It’s sometimes described as giving wine a “crisp” flavor. Remember Sour Patch Kids candy? Those are highly acidic. You perceive acidity on the sides of your tongue. Alcohol: The reason most people even bother with wine to begin with. By this point I’ll assume that you know what alcohol tastes like. 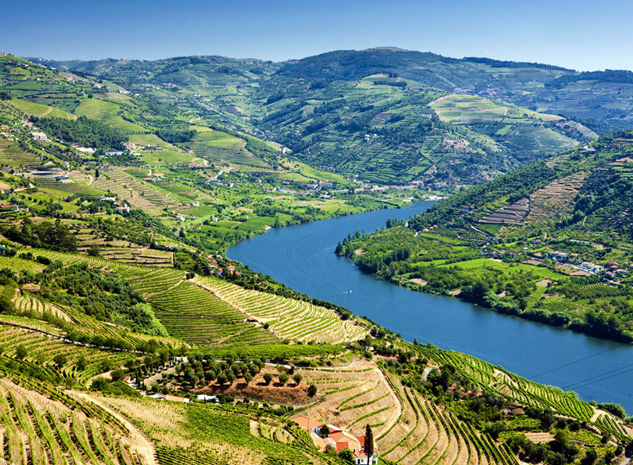 When it comes to wine the key is judging how much is present, which itself is usually a factor of the climate where the grapes were grown (warm and sunny = higher alcohol). 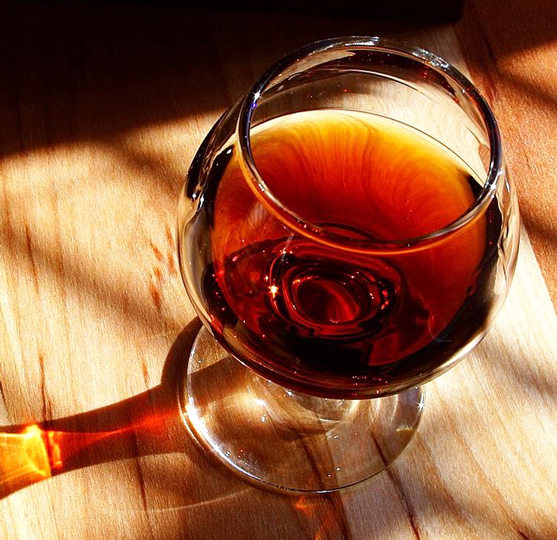 Sweet and fruity is good, but try to appreciate the other aspects of wine as well. You'll be glad you did. Again, the key idea when it comes to taste is for all these sensations to be in balance with each other and for no one component to stand out too much. Beyond that it’s really a matter of personal taste. One word of caution is not to dwell only on the sweetness of a wine. It’s a sure mark of a novice wine drinker. Yes, we all like sweet stuff, but when it comes to impressing your WASP friends, you’ll need to look beyond the sweet. The Body: I’ve always found this term a little confusing because it’s said to the describe the “weight” of the wine in your mouth. Well, doesn’t all wine weigh about the same? Technically yes, but when it comes to wine speak the answer is a resounding no. What wine snobs are actually describing here (I think) is the concentration of the wine. The analogy I’ve heard used most often is the difference between types of milk. Skim is light bodied, whole is medium bodied, and cream is full bodied. Again its all very subjective, but in general if you describe concentrated/high alcohol wines full bodied and thin/low alcohol wines light bodied, you can’t go wrong. If you’re in a pinch, you can always hedge your bets and go with medium bodied. The Finish: The final aspect of any wine tasting and no, I’m not talking about the part where you say goodbye and hope that you’re cool to drive… The finish of a wine describes how long the flavors and aromas of a wine last after you’ve swallowed it. In general the longer the finish the better, that is unless the wine has left you with a bad taste in your mouth… Fortunately the answer there is easy, just try more wine till you find one you like! This one is easy, just go out, get a bottle of wine, and start drinking! Try to find bottles that have in depth descriptions listed on the label. At first read the descriptions and then try to find those flavors yourself. Once you’ve gotten a few bottles under your belt, try drinking first and then reading to see how close you can get to the experts analysis. Make sure to sample a variety of wines. It’s easy to get caught up with a single type or style of wine, but be sure to explore so you know what else is out there. Once you’ve got a little confidence, attend an actual wine tastings, even if it’s just at the local wine shop. That gives you the opportunity to sample a bunch of different wines side by side without having to pay for four or five complete bottles. If the wine bug gets you, then start reading up. There are literally thousands of books out there on the subject. I’ve found the “Wine for Dummies” series to be a good all around guide.